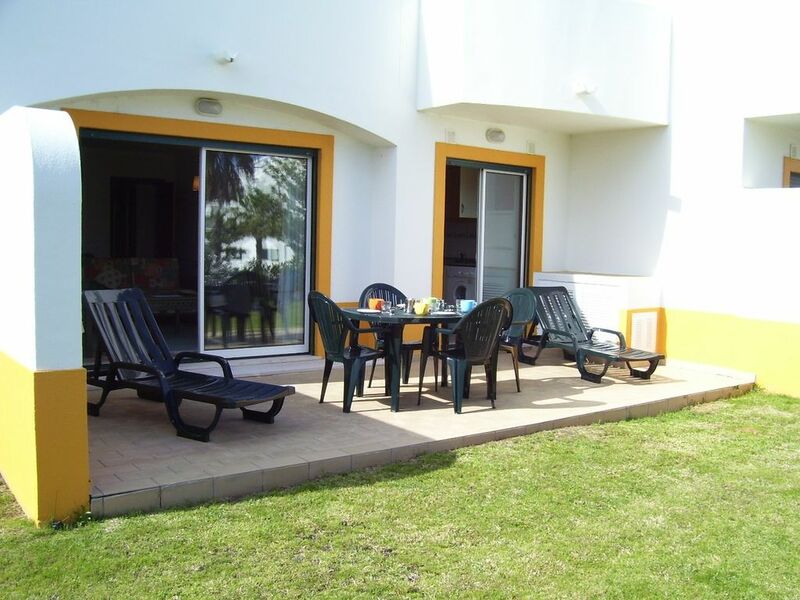 This apartment is fully licensed with the local authority.Quinta Dos Brejos is a quiet and peaceful resort within walking distance of the beach. The village has easy access to all amenities, including the famous local markets for bargain hunting, and the popular Strip area known for its many excellent restaurants and bars. Quinta dos Brejos is located in the family friendly Bela Vista area. The apartment is ideally positioned between the old town and the strip. It is also the perfect base to enjoy some of the best golf courses in Europe. Out & About: The numerous beaches are ideal for sun bathing during the day or for pleasant evening walks. The condominium has two swimming pools, an adult pool and a paddling pool for small children. The communal area includes terraced and grassed areas with plenty of space for children to play safely. The apartment has one bedroom with twin beds and two further bed settees in the living area allowing the apartment to accommodate four. It has one bathroom and a kitchen equipped with fridge, freezer, cooker, hob and microwave. The apartment also has a patio area and parking. Swim with Dolphins at Zoo Marine. The dolphin interaction programme lets you get to know and interact with trained bottlenose dolphins, under the supervision of specialised professionals, at the same time as taking part in sequences of aquatic behaviour. Other attractions include the seals and sealions, Tropical Birds Show, Birds of Prey and lots more. One exciting adventure. Share this crazy and dizzy adventure unique in Portugal. Enjoy it in safty with your family and friends. Highchairs available. Please enquire for cost. The apartment was everything that was stated in advert, 20 min walk down to the 2 watch island, supermarket's on both sides of the main road, plenty of bar's and restaurants. Old town only 30 min walk away. I have stayed for many years in this area, this the first time in this apartment. Will recommend to friend's and family. We all had a very good time. We had no problem getting taxi's or the bus to were ever we wanted to go. I stayed at this apartment with my 17 year old daughter. It was one of the most relaxing holidays we have had. The apartment was clean and well kept, the pool area was 30 seconds walk from the front door, the terrace and garden were private. Although the road was close, I wouldn't say it was a busy road, and did not stop up relaxing on the patio, or having a good nights sleep. The terrace was a little sun trap with all day sun. The walk into the Old Town took approx 20 minutes. Turn left at the entrance to the complex and turn right at the roundabout then its a straight walk, but we stopped for full English Breakfast half way at a small cafe next to Belavista Hotel. 5 euros for breakfast and drink. If you turned right at the Complex entrance the Bus Station was only a few minutes walk were you could get one of the City Buses into the Old Town or to The Strip. 1.10 euros per trip regardless of distance but we bought a Bus Pass and loaded it with 20 credits ( 1 credit per person per journey) and it only cost us 14 euros. Just further down from the Bus Station was Zoo Marine and 2 minutes after that was a Lidl supermarket. We got all the basics for the apartment, water, bread butter etc and it had a good range of groceries. We got a taxi back which cost 4 euros. We ate out every night either in the Square at the Old Town or on the Strip. The price of the meals was very reasonable, piri piri chicken seems to be a speciality and was lovely, and only 6.50 euros. The beach at Albufeira was lovely and clean, and had lifeguards on each day. All in all we really enjoyed this holiday and would definatley stay at this Apartment again. A very nice modern spacious apartment and spotlessly clean if a bit underequiped . Nice patio area and although as someone else said it does front the road there is a good size grass area and we didn't find the noise from the road a problem. But a car is essential as it feels like it is in the middle of no-where. When we booked were told it was a walk to the beach.Which it isn't! When we arrived were met by agent with the keys and asked the question 'Which way to beach and town?' to be told it wasn't walkable would take maybe 35-40 minutes and was given the number for a cab company. If you have to call a cab everytime you walk out the door it does add a lot of cost to the holiday.We did try the walk once but there is a big hill in the middle and although we walk quite fast took us 20 miniutes to reach the first decent supermarket and that was only halfway to the old town and beach. Picked up a cab for the rest of the way. There is a very small mini market a short walk from the apartment but the nearest restaurant would be a good 15 mins.walk. Have never stayed in rental property before that didn't have an information folder. Things to do in the area and especially details of the bus services would be good. Because there is a bus stop about 5 min.walk and a town bus comes about every 30 mins and costs €1.10 per trip ( they are city buses and go the circuit) But had to find this out for ourselves and when you only have a week time is wasted as we were there in June and there was no-one else around to ask. I would only recommend this property for people who have transport or are happy to stay by the pool.I don't cook while on holiday but if I had wanted to the kitchen is not really equiped to cook a proper meal. There is a full size cooker,hob and microwave but very few things to cook in or a knife to prepare vegetables. We are pleased you found the apartment clean which is a big thank you to the apartment management team. As part of the service the agent always informs guests of taxi numbers should you require to use them and their telephone number for you to contact them should you require help or assistance.The apartment is in a residental area of the town and not in the middle of nowhere. As you arrived by bus you will have arrived at the bus terminal which as you will know is five minutes walk from the apartment. From here you can pick up a leaflet and information of bus services etc. There is a bus stop within yards of the complex and is most definitely not five minutes away. It is in fact over the road from the mini market which you state is a short walk away. This market caters very well for the basics Big supermarkets - more choice. When you enquired I did state restaurant about 10/15 mins away??? and you commented that walking 15 minutes is not a problem. We walk to town and it takes us 17mins to the supermarket you talk about and then about another five to the beach and old town. So I'm not sure of your route. If you took a taxi from the supermarket then you would have had a very short and expensive journey to the old town. Mini fun train also goes to these places. Algarve Tours are next to the mini market for information on whats on and tours etc. information kiosks in the shopping centre and old town are also available. We have taken on board your comments and added Algarve guides to our website for future reference. There are several snack bars and cafes etc within easy walking distance. We do recommend a car on the website but this is purely so that you can explore further afield this beautiful country and see the real Portugal. The kitchen is well equipped with cups,glasswear,plates,knives,forks, spoons etc and two pots which can be used to boil potatoes etc. Also a meat tray and frying pan. What kind of meals do you want to prepare? There is a knife to prepare veg, bread knife,ladle,bottle /tin opener etc. You have an Iron and board, coffee machine,kettle,toaster and satalite TV. Patio furniture. We always welcome suggestions of how to improve the apartment and your holiday enjoyment. Very spacious, clean one bed appartment, everything we need was in the appartment, it was like home from home. It was a 20 minuite walk to the top of strip with bars, resteraunts and shopping or a 30 minuite walk to the old town and beach with more resteraunts and shopping. There was a good sized lidle not far away from the appartment, although you would probably need a car for shopping trips, but taxis are fairly reasonable. Vendor couldn't have been more helpful when booking but heard nothing on return?! Sadly the description saying 10 mins from beach and centre etc meant in a fast car. The apartment is in a new development, un-signposted, a rough 30 minute yomp including steep uphills along unfinished, unlit roads from a supermarket or any shops, taxis, buses. I say rough 30 minutes as we got it down to 25 one night, but then we are both very fit. This would not suit anyone without a car at all. Taxis can we taken from the resort to the apartment but not vice versa as they do dont stop for hailers in Portugal, or answer the telephone for bookings and there are no ranks to collect one from in this area. The main strip and old town are around an hour's walk away and the marina nearer two. The garden faces on to a very busy main road, so patio unusable, for quiet meals or relaxing loungers, unless quite late in the evening. There was a contact from thw property company to call on arrival and for assistance. After the first night spent in pitch darkness, as the air con units had blown the trip switches, however, we stopped using this number as no action was taken. By the torches in the kitchen I would assume this was not a one off. So in the dark, with no walkable aid, not a great first night. Over the week, other issues arose such as the shutters breaking, stuck open and worrying us further after our contact had advised us " please use the shutters, its not as such a high crime area but we dont want to encourage it to be". Hmm for two women travelling alone not the best welcome ! I'm quite surprised and disappointed with this clients response. Apart from the fact that her review is unfair, it's not accurate or complete. I assume you will be posting a response to the comment so I would not mind if my comments are used to explain the true facts.As the property manager for this apartment and having received various clients personally, I must state that this is the very first complaint I have received regarding the accommodation. We have however been told that people enjoyed their stay.Regarding the situation with taxi's, we gave the guests the telephone number of the 24 hour taxi service from Albufeira, as we do with all clients. This has been the practice with all clients in the past and this is the very first report ever that the phone does not get answered. There is a coffee shop/bar no more than a 5 minute leisurely walk from the front door of the apartment and a snack-bar (Daniel's) no more than 8 to 10 minutes away. The shortest route to the centre of Albufeira is via a normal road with street lamps and side-walks. We responded to both calls we got from them and the two problems they reported were reacted to.The air con was checked and then again tested before the entry. It turned out that the solution was temporary and the problem re-occurred after their arrival. This is unfortunate, but I am surprised at the comment - "first night spent in darkness". They gave me a call when the electricity went off and after 2 minutes on the phone they had the power back up and all in order? No more calls on this matter so I assumed they had no more problems with this. The outdoor AC unit was inspected again in the days following and we were informed that the unit needed repairs on factory level and could not be seen to immediately. The clients were told this in a subsequent telephone conversation. Unfortunate, but unavoidable. After visiting Albufeira and staying in this particular apartment in july of this year with my wife and two childern under five i felt i had to reply to Lucybeds coments with my views on the apartment and facilities. 1.We found the agent very helpful,he met us in Albufeira showing us to the apartment and running through the workings of appliances e.g air con,shutters etc. 2.Apartment was well kept,in pleasant and tranquil surroundigs. 3.We walked in to Albufeira on several ocassions taking 15-20 mins,with small childern,i would of thought two adults would manage it a lot quicker. 4.Taxi's to and from Albufeira where never a problem for us quite the opposite. 5.Bus stop,general store and bar within 500-600yard walk from front door,in fact i got english paper every morning of holiday,buses into town ran every 20 minutes. 6.Bus station for buses to Albufeira.and other surrounding towns/villages no more tha quarter of a mile away. 7.Swimming pool and toddler pool on apartment site,very private,safe and secure ideal for childern. 8.As a family i can honestly say we really enjoyed our weeks holiday in Albufeira and would not hasitate to re-visit Albufeira and stay in the same apartment/location again. Albufeira is undoubtedly a fun resort attracting a varied mix of holiday makers. The old town remains a pretty village with narrow cobble stoned streets, twisting lanes of whitewashed houses and terracotta roofs above a wonderful spread of beaches. Courses such as Penina, Quinta do Lago and Vilamoura have been established for more than 20 years, but the more recent additions of San Lorenzo, voted No. 2 in Europe, Vila Sol, two times venue for the Portugese Open and Pinta have done much to establish the Algarve`s reputation for attracting the discerning golfer. Off the course there is a wealth of restaurants, serving some fine fish food and delightful local wines, Moorish ruins and castles to explore, and if you are looking for total relaxation then why not find one of the secluded beaches that dot the length of the coastline.